Greg Hobbs is a bit of a dude. I’d met him before, on the previous year’s Barossa trip, and it was nice to catch up again to see how the wines were doing. It was a Sunday afternoon, and he’d just finished a long Sunday lunch with his family. A warm spring afternoon prompted a relaxed atmosphere, and we began with a gentle stroll through the vineyards. 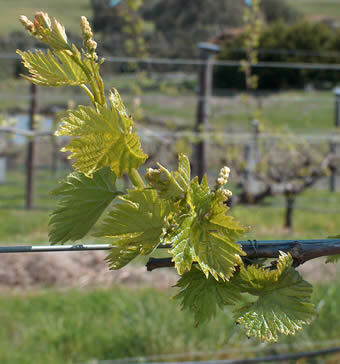 There’s something about spring in a vineyard. The season hasn’t really begun, and just the first few signs of life are emerging. Thus, there’s an atmosphere of pregnant anticipation. What will this year’s crop bring? Greg’s property is in an illustrious neighbourhood. 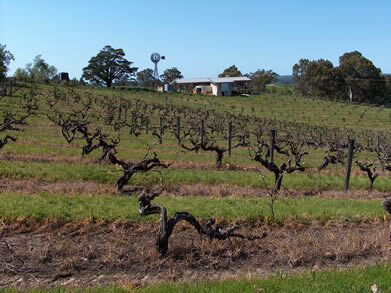 Right nextdoor is Chris Ringland’s pad (pictured right), with his tiny Three Rivers vineyard, that produces what is perhaps, thanks to US collectors’ enthusiasm, Australia’s most expensive wine. 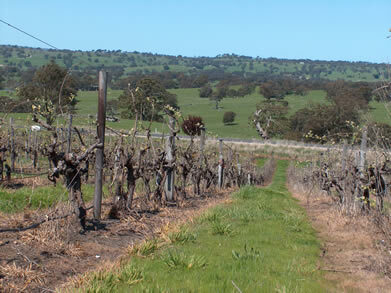 We had a quick wander through this vineyard, before inspecting Greg’s almost identical vines a few yards away. Since the last visit, Greg has repositioned his sweet wine range a little, making them in a richer style with more residual sugar (from 2005 vintage). His reds continue as before, with the hugely successful Old Vine Shiraz, and his Amarone-style Gregor Shiraz. Quality is top-notch: I was really impressed by these wines, which I reckon justify their relatively high prices. After trying the wines, we took advantage of the relaxed mood, chatting over a stubby. This is what Sunday afternoons are for. Interesting herby, tea-like notes on the nose. The palate shows soft, concentrated, sweet fruit with a strawberry-like character. An interesting, unusual wine that may develop a lot of complexity with age. Sweet and luscious now.